My wife, Jo, handed me the phone. “It’s Mary Ann (our stockbroker). She wants to talk about the farm”. I recently wrote about how lucky we were to work with Mary Ann. She was a stockbroker with years of experience and put it to good use. The farm has been in Jo’s family for over a century. Rightfully, Jo’s portion should be inherited by her daughter, Holly. Mary Ann said we need to call an attorney and set up a trust. I pushed back, “Trusts are for rich people, we both have wills; that should be enough!” Mary Ann was emphatic, “No it’s NOT!” She started asking me questions I couldn’t answer. Reluctantly, I agreed to call my attorney. Mary Ann was right – we needed more protection. Thirty years later, the trust is still in force. We’ve seen two situations where a couple was married for many years and the wife passed away. The husband soon remarried – and a few years later, he passed away. His second wife inherited everything. I believe a husband should take care of his spouse – children should wait their turn. Recently, David Holland published a short column titled, “You Might Consider a Trust When . . .”. It reminded me of Mary Ann, passing along words of wisdom based on many years of experience. I contacted David and asked him for an interview. DENNIS: David, on behalf of our readers, thanks for taking the time to educate us. Much like Mary Ann, I’m sure you have seen many situations and strongly suggested your clients contact an attorney and set up a trust. Can you explain to our readers the difference between a trust and a will? DAVID: Always good to talk to you, Dennis. I’m not an attorney, but I am a Certified Trust Financial Adviser, as well as a CPA and CFP®. I’ve been asked many times by my clients to guide them in their estate planning. “Estate planning” is a general term used to describe the process of getting your assets to your heirs. If you ask an attorney, a key step will involve the preparation of the proper legal documents such as a Will or Trust. Ask an accountant or financial planner, and the focus will be on strategies to minimize income and estate taxes. And, a bank or trust company might focus on investment management, bill-paying services, and trust administration. Make sure to tell your readers, Dennis, that legal documents such as Wills, Trusts, Power of Attorney, etc. are state-specific. Many state statutes address these documents, those who prepare them, and those who serve under them. Back to your question . . . Wills and Trusts have a lot in common. They both set forth the answers to an inter-related set of questions: Who do you want to get what and when? A Personal Representative’s (Executor’s) job is to do what the Will says. 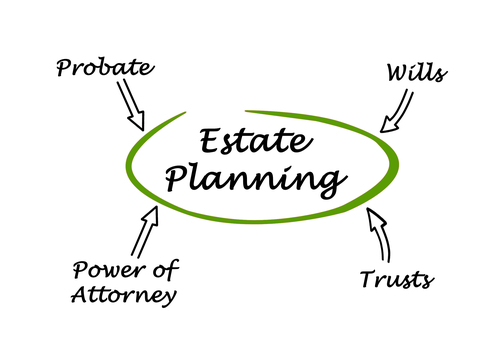 The responsibilities include carrying out a deceased person’s final wishes for his or her probate assets (i.e., property that is not in a Trust, isn’t co-owned, or does not have a beneficiary designation). A Personal Representative’s duties also include taking an inventory of the estate, following the legalities of the probate process, liquidating assets, satisfying debts, and distributing the remaining assets to designated beneficiaries. Trustee responsibilities are similar to those of a Personal Representative. An individual’s (or couple’s) trust document also sets forth how, when, and under what conditions, distributions will be made to the beneficiaries of the trust. In most cases I’ve seen, whenever someone gets a trust, they also need a will. Some situations, however, only require a simple will. DENNIS: I mentioned two cases where the surviving spouse changed her will after the husband died and left all the money to HER children – even though they promised each other they would not do that. Is that fairly common? DAVID: This happens more than people realize. It is also a common fear among adult children of the blended families. It is not a hard thing to address and minimize from a legal standpoint, but it does require some difficult conversations. Once the conversations take place, then it’s time for the attorney to prepare the proper legal documentation to see to it that wishes are fulfilled. DENNIS: In today’s world, it’s not uncommon for a married couple to have three sets of children – his, hers and ours. I would guess that setting up a trust to be fair to all concerned is fairly common. What are some other situations where you suggest clients consider a trust? DAVID: There are many situations where a trust would be worth considering. Some easy examples include when there is acrimony among the children of prior marriages. Another is when the deceased spouse wants the surviving spouse to be taken care of first, and have access to money that will ultimately go to the deceased spouse’s children from a prior marriage. Example: Wife gets income from deceased husband’s assets until she dies, then those assets go to his kids. ‘Danger, Will Robinson, Danger! !’ A trust would be absolutely critical in this situation. The other ‘big one’ is when there is a child, adult or minor, who has a history of mental, substance abuse, or other problems that make it a bad idea for them to get a lot of money at once. Other children, like those with autism or Down’s syndrome, will need someone to look after their assets for them. Thus, it is especially important to make special trust arrangements for special needs children. DENNIS: You mentioned “special needs” children, which hits close to home for Jo and me. We have grandchildren that have had some challenges since birth. Is there a typical way that most of these situations are written up in a trust? DAVID: No pun intended, but ‘special needs trusts’ are ‘special’. Not all estate planning attorneys will prepare them. The language that goes into one of these trusts has to be carefully worded to avoid the loss of governmental benefits that the beneficiary may otherwise receive. In addition, the trusts also must do what they can to protect the children from financial predators. DENNIS: When I researched annuities, I discovered there were cases where the financially savvy partner bought an annuity to protect the non-savvy partner from financial predators or leaning on financially uneducated children to manage the nest egg. Can a trust offer similar type protection without necessarily investing in an annuity? DAVID: Candidly, Dennis, I think a trust is a much better solution for these situations. A trust can truly be tailored to the specific needs of the client and, thereby, allow the client to address how they want to invest their monies more precisely. If an annuity makes sense, that’s fine, but that decision should be based on the merits of the annuity, not on the annuity accomplishing an estate planning goal. If you are looking for safe dividend income, our friends at The Dividend Hunter have a unique Monthly Dividend Paycheck Calendar. Their model portfolio is approximately $500,000 and averaging over $4,000/month. Tim has offered our readers a 50% discount on their first-year subscription price. CLICK HERE to take advantage of their generous offer. We appreciate our readers going through this link as we receive a small commission which helps us keep our website free. DENNIS: One final question. Any last minute tips or suggestions you want to pass along to our readers? DAVID: Always a pleasure, Dennis. I’ll leave you and your readers with one more thing that we haven’t talked about: the charitable uses of trusts. A few years back, “Steve” asked me to help him arrange his estate plans. Steve wanted an impartial, non-family member he could trust to oversee his affairs. I agreed to serve as his Executor and Trustee. Sadly, Steve died shortly after his estate plans were put in place. His final wishes called for a portion of his assets to go to his ex-wife and siblings, with the balance to be held in a charitable trust to provide special assistance to disadvantaged children. Steve authorized me to select and distribute 5% of the trust to a worthy organization each year that fit his parameters. Since 2010, with the careful stewardship of Steve’s funds, a measurable difference has been made in the lives of hundreds of needy children! I tell you all of this, Dennis, to underline a very important point: many people die without feeling as though they have made a difference in this world. Many people don’t have heirs or someone whom they feel strongly about getting their money. Can I tell you something? There are children who are alive and thriving today because of the plans that Steve and I prepared. If that’s not making a difference, I don’t know what is! DENNIS: Wow! That is something I had not thought of – you make an excellent point. If I had no heirs, I would certainly believe a competent trustee could make better decisions on where and how my life savings could make a difference – as opposed to the government. David, on behalf of our readers, thank you for your time. Dennis here. My daughter and I discussed a widow friend who recently remarried. She said it best when she said, “Dad, she fulfilled her obligation, till death do us part. She has a right to be happy.” No one can account for all potential issues in the future; however, a good trust can help insure the wishes of the deceased are fulfilled. Congratulations to the Houston Astros on winning their first World Series. It was a seven-game affair with plenty of excitement. It’s good for baseball when teams that have not won before come out on top. We’ve sure had some blockbuster political issues pop up the last week or so. What galls me is this. It is always made to be a partisan issue; one party attacks while the other tries to sweep it under the rug. When are people going to demand honest accountability? The American people are fed up with political corruption. Too many politicians get away with things that would put the rest of us common people in jail. Try not paying your income taxes, (like some congressmen and political leaders have done) and see what happens. We need some law-breaking politicos to go to jail to set an example for politicians in the future. Right now, my guess is many politicians do not fear any consequences even if they are caught. Sorry for the rant, but I feel the TV pundits are missing the point when they use the current revelations to argue partisan politics. Investigate honestly, charge where appropriate, and give them a fair trial. If they are convicted of a crime, we need to set some examples with these lawbreakers or the situation will continue to get worse. Here are some quotes entitled “political truths”. There is no distinctly Native American criminal class, save Congress. If you are on Facebook please check out, like and follow our new Facebook Page. My wife and I established our own Living Trust in 2014. On paper we own nothing….no life insurance, real estate, vehicles, bank accounts, etc. We have no children but wanted to protect assets and avoid probate. Luckily I talked my parents into establishing their own Living Trust in 2016. This was done just in the nick of time as my father passed ten months later. Under his Will, which was part of the Trust, he established a Special Needs Trust for our disabled mother who was on govt assistance. This provided a method for me as Trustee to see to my mother’s needs above and beyond what Medicaid provided. She passed two weeks ago and the remaining funds are to be split, per my father’s Will, among his three children. So, for about $2000 in fees to set up the Trusts, my parents protected nearly $450,000 that will now be split among us kids. Without that Special Needs provision, all of that money would have went to Medicaid. The best advice I can give anyone is just do it. Unless you are terminally single with no children and no assets at all, simply avoiding probate (and probate attorneys/costs) will more than pay for the fee to set it all up. In addition, most Trusts will include Durable Powers of Attorney, Medical Powers of Attorney, HIPAA Releases, Living Wills, Last Wills etc in the price of the Trust. Try purchasing those documents alone for a married couple and it will likely cost more that a Trust. I was/am the Trustee for their Trusts and I cannot tell you how much easier it is to manage another’s affairs with all those documents already in place. Keep in mind that Medicaid has a five year look back period so if you have to go on assistance and your Trust is newer that five years, your assets may not be protected so setting up your Trust sooner rather than later is important. Thanks for taking the time to write. As David said, there are many good reasons for using a trust, looking after those who cannot do so for themselves, plus tax considerations are a couple of them. Your letter offering advice to others is a perfect example.